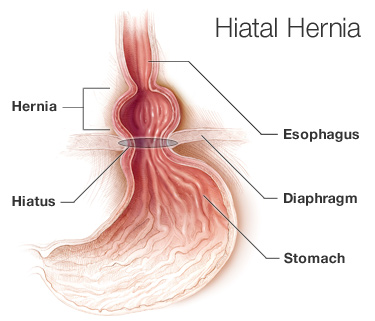 Hiatal hernias are a common problem. Sixty percent of patients over 50 years of age have a hiatal hernia. The important thing is to recognize whether the hiatal hernia is actually the cause of the symptoms. Many symptoms are blamed on hiatal hernias that are due to other pathology. Hiatal Hernias and Paraesophageal hernias are very similar, but hiatal hernias of the sliding variety are the most common type of hernia. In sliding hiatal hernias, the stomach and the lower esophagus slide up into the chest through the hiatus. 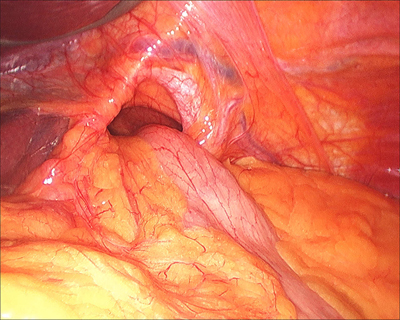 Paraesophageal hernias are less common but are more concerning. In these, the esophagus stays in its normal location, but part of the stomach and sometimes other abdominal organs squeeze through the hiatus. Paraesophageal hernias have a higher risk of becoming “strangulated” which is when the blood supply is cut off which is a surgical emergency. Diaphragmatic hernias (Both hiatal hernias and paraesophageal hernia) can be diagnosed through endoscopy or an upper GI series (barium swallow study). Hiatal hernias can cause a myriad of symptoms. They can present with chest pain, shortness of breath, heart palpitations, vomiting (sometimes bloody) and pain with eating (dysphagia). Hiatal Hernias can contribute to significant reflux due to the fact that the lower esophageal sphincter is no longer in its proper location in the abdomen. When the lower esophageal sphincter moves into the chest, it no longer functions properly and remains open allowing gastric acid to splash into the esophagus eroding the esophageal lining causing esophagitis. Given that hiatal hernias are associated with gastroesophageal reflux disease (GERD), they are associated with increased heartburn, esophagitis, Barrett’s esophagus, esophageal cancer and dental erosion. 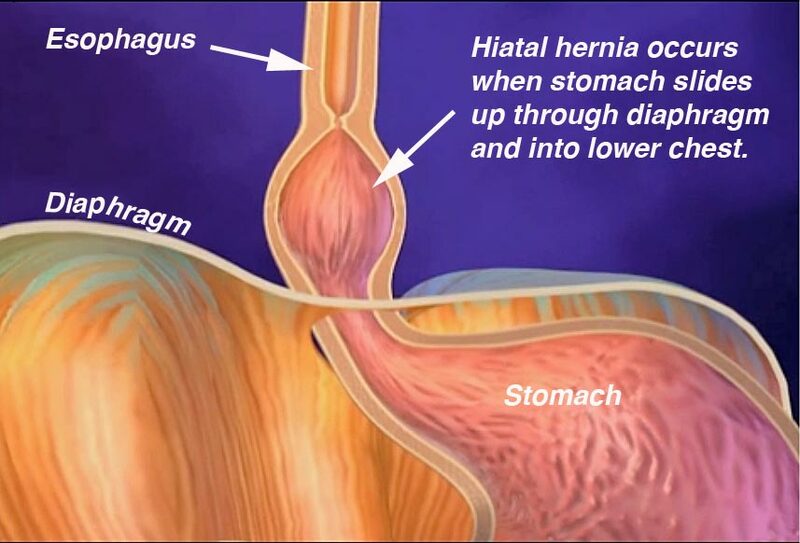 Risk factors for developing a hiatal hernia include heavy lifting, chronic coughing pregnancy, violent or frequent vomiting, straining, constipation, obesity, heredity, smoking, drug use and stress. The surgery for both forms of hernias is the same. Using the latest techniques, our surgeons perform hiatal hernia and paraesophageal repairs entirely laparoscopically. The surgery consists of three important steps. First, the hernia is “reduced”. We meticulously remove the attachments that hold the stomach and esophagus in the chest. 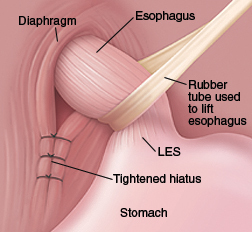 After doing this important part of the procedure, the lower esophageal sphincter (LES) is returned to its standard position in the abdomen where it works more effectively. Second, the hiatal hernia is closed. We close the hiatal hernia with permanent sutures. Depending on the size of the hernia, an absorbable piece of biological mesh may be used to buttress the repair in order to decrease recurrence rates which are high if the size of the hiatal hernia is large. Most patients leave the hospital the day after surgery. If their job does not require strenuous activity, they are usually able to return to work in one to two weeks. After surgery, you will be kept on a soft diet in order that food does not get stuck secondary to swelling immediately after surgery. Specific diet instructions are located here. You will want to chew slowly and thoroughly and avoid carbonated beverages. Fully cooked pasta and vegetables are a good choice while heavy meats and raw vegetables are likely to cause problems. Once the swelling has dissipated within four to six weeks, you will be able to resume eating all foods without restrictions. We follow all of our patients closely with appointments every 2-3 weeks after surgery. We usually see patients for 2 or 3 post-operative visits at which time they are usually eating all foods and off all their antacid medications. We call of our hiatal hernia patients yearly to ensure that they have continued resolution of their symptoms.